The upcoming elections are unique in US political life. One of the candidates is, for the first time, a woman. The other candidate had never stood for election for any public post, and has defeated his party’s professional politicians. Both potential presidents are noted for their scandalous reputations. This state of affairs is a symptom of the US electoral system, the bias of official institutions, and the population’s willingness to risk radical solutions. The voters, however, are in a difficult situation since they will have to make a choice between two very bad candidates. Party conventions will soon nominate both Donald Trump and Hillary Clinton (Trump already nominated). What baggage are Trump and Clinton carrying following the primaries? Trump had an impressive run, receiving 1542 delegates out of 2472, with 1237 required for nomination. Ted Cruz, who came second (with 559 delegates) dropped out of the race in May. During the Democratic Party convention, 4765 delegates will cast their votes. Clinton needs more than half, or at least 2383 votes. 2220 are already guaranteed, plus 592 superdelegates who are not obligated to vote for her but it is highly unlikely they would vote for anyone else. At this point, we can be certain she will be the nominee. According to opinion surveys, Clinton is ahead of Trump by 5-10%. In one poll, 47% favored Clinton, while 40% favored Trump. In addition, 5% plan to vote for someone else, 6% are undecided, and 2% don’t intend to vote or refused to answer. Therefore, even a small change can launch Trump into the lead. However, he would first need to overcome intra-party divisions, which he will most likely succeed in doing. Naturally, one can expect all manner of surprises from the upcoming convention, but the party elite will hardly be able to implement its treacherous plan to overthrow the billionaire in the name of “anyone but Trump.” Thus far, no plot against Trump has succeeded. He has literally out-Trumped them. It is evident there exists a sizable GOP faction opposed to the New York magnate. They want the rules committee to allow the delegates to vote “their conscience”, rather than in accordance with the will of their states’ voters. This scenario is not very plausible. The GOP lacks an alternative to Trump—had one existed, it would have been presented to voters already. Secondly, nominating someone else would inevitably lead to GOP defeat because people who voted for Trump during primaries will simply stay home in November. Thirdly, any discussion of removing Trump would further weaken the declining GOP bloc by showing the absence of political unity on the eve of an election. It would appear, however, that Trump has made an important step toward reconciliation with the GOP establishment. After the primaries, he replaced his campaign manager, 42-year-old Corey Lewandowski, with the scandal-prone Paul Manafort who, back in the day, was an advisor not only to Ronald Reagan and George W. Bush, but also such luminaries as Somali dictator Siyad Barre, Zair’s president-for-life Mobutu Sese Seko and Ukraine’s president Viktor Yanukovych. Manafort has spent his whole life working for GOP candidates, has good ties within the party, and is appreciated and valued there. Trump probably wants to use Manafort’s abilities in order to prevent a split right before the convention, and wants to establish mutually beneficial cooperation. Showing flexibility and willingness to negotiate helped Trump win over the “undecideds”, given Clinton’s continuing scandals. It’s obvious that, in spite of her guaranteed nomination, her position is fragile. She struggled during the primaries, winning 29 states against 21 won by Vermont socialist Bernie Sanders. Her modest opponent offered tough competition and mobilized millions of disaffected voters using his fiery liberal rhetoric, not allowing his heiress competitor to try on the crown before the final vote was counted. Clinton had to change her position on a number of issues after Sanders’ criticism of US inequality resonated with millions of voters. Her constant scandals are also destabilizing the ranks of her potential supporters. The entire executive branch and corporate media establishment is being employed to keep her afloat. Any other candidate who suffered such irretrievable damage to her reputation following scandals associated with Middle Eastern Monarchies financing the various Clinton Foundations (while Hillary was the Secretary of State), the case of the sale of Uranium One from which Hillary, apparently, received a “commission,” plus her mishandling of classified information on a large scale. However, since the current administration is backing Hillary to the hilt, she still remains the nominee. The Justice Department recently ended the probe into her emails and her private email servers. Obama already endorsed Hillary’s candidacy, though he was expected to do so later in the race. Many Americans were outraged that Clinton came to the campaign rally where the endorsement was made on Obama’s presidential plane, which is a violation of campaign laws in any law-abiding country. In Europe, a candidate would simply have to resign the candidacy and then leave political life for a long period of time. But in the current political situation in the US, the “right” candidate can get away with almost anything thanks to an intentional lack of media and government oversight, which is provoking protest activity among average citizens. In reality, both Trump and Clinton are being promoted by current political and financial elites who have steered the country into, if not a crisis, then definitely a pre-crisis situation. They have provoked the worsening of the international situation, the growth of crime and terrorism inside the US, the growth of unemployment and the worsening of citizen’s welfare. That is the primary reason the “socialist” Sanders won in 21 states and also why many Sanders supporters are now flocking to Green Party candidate Jill Stein now that Sanders has thrown in his lot with Clinton. On the other hand, many believe that Trump spent his entire business career fighting against big banks—this is, after all, what a real estate developer does. Clinton, on the other hand, has been their favored candidate for well over a decade, dating to her term in the US Senate, where she represented New York—the biggest US financial hub. Likewise most of Trump’s primary opponents came from the globalist faction of the GOP, with many of them currently openly advertising their willingness to shift loyalties and to align themselves with Clinton. By the same token, many Sanders voters, who are predominantly anti-globalist, will almost certainly vote for Trump in November. So the battle lines are drawn: globalism versus economic nationalism, and Trump’s potential electorate resembles that of the Brexit Leave voting population. Especially amid the fact, that Sanders is now supporting Clinton despite the all previous rhetoric. One should also not prejudge the US elite preferences. After all, in spite of all the predictions to the contrary, Brexit appears to be on track which suggests that a sizable chunk of the British financial elite prefers a return to economic independence. Clinton offers the continuation of policies that have been in place since the early 1990s: economic expansion through market penetration and dominance, until every country on the planet is inextricably woven into the web of US-based corporations, by force if necessary. But that approach is beginning to fail economically. While these policies still have widespread support, the fact that Brexit is taking place and Trump is about to become the GOP nominee indicate the elites are entertaining a major change in policies that would end the post-Cold War “New World Order” and lead to the return of economic nationalism. In other words, Clinton is supported by the military industrial complex, oil and gas companies, the Wall Street and the world’s virtual space cartel. Trump is representative of the national industrial corporations aimed on the home consumption and export of civil industrial production. The majority of voters disapprove of both candidates. Recent ABC News and Washington Post polls showed that 60% of US citizens disapprove of Trump, while 53% disapprove of Clinton. It is an unprecedented result since 1984, when such polls started to be taken. It would seem US voters will go to vote not for, but against a candidate this time around. At the same time, 44% of Americans say they would vote for a third party candidate. Clinton continues to lead in a one-on-one match-up against Trump, but the gap has closed in spite of all her campaign advantages. 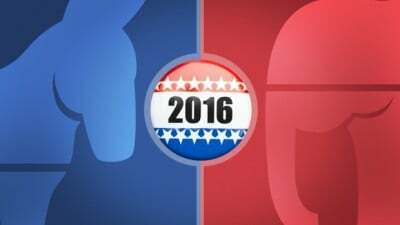 One can expect a heated campaign, bold slogans, and fiery speeches, which are all part of the US election show. But, in spite of the two candidates’ unattractiveness and the inconsistent US electoral system, Trump is likely than Clinton to deliver the changes the voters want. But will he be able to satisfy the hopes of his voters once he becomes president? Will the US elites allow him to do that?